can you do some branches under 40k of the factions availale e.g. have an eldar page, a tau page, a necron page etc. I'd like a separate dark angels section - i don't want us to be in the same section as you filthy savage barbarian space wolves. Well, we're not barbarians, we just know how to get the job done. If you can get enough votes, then I'll get on it, but until then, there's no army specific sections. I'd support it, don't put in ones for armies no-one uses though. Michael, your puny emo angels are no match for my 1 D6 deep strike Angels! But the D/R needed more wins, becasue they had to prove themseles to the Emperor. Every other legion had already done that. We don't get pissed before battle, we get pissed after battle. That's after the glorious victories we win in the name of the Allfather! Aroo! The Space wolves are like Father Jack Hackett from Father Ted - they have no concept of 'soberness' - the words 'drinking in moderation' have no meaning to them - they are always pissed. 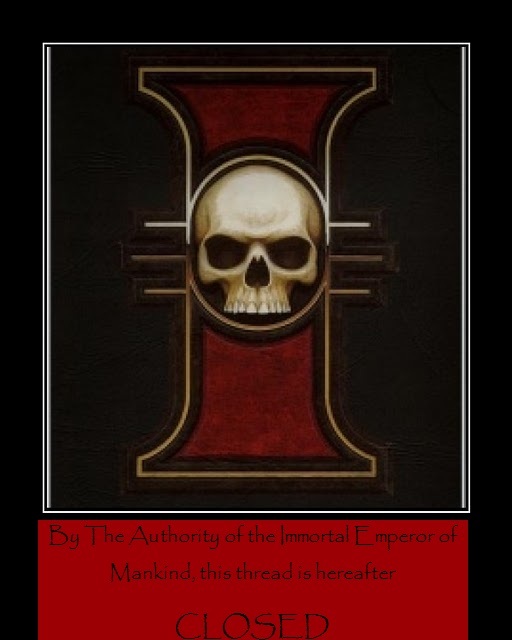 Ie: the dark angels player would only really look at the dark angels section. and would only look at the others to make fun of them! Lewis has a point, it would be too exclusive. That's why I'm leaving it as it is.